The Golden Boot or Golden Shoe is an association football award presented each season to the leading goal scorer in league matches from the top division of every European national league. 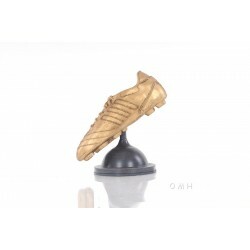 Our Golden Boot is made of 100% iron frame; like all of our models, no plastic parts have been used. The boot detaches from the base for easy dis-assembly, if needed. The model is handmade and painted in gold just like a real one.